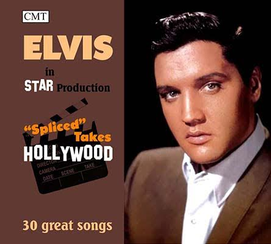 CMT is proud to present their latest release, 'Spliced takes - Hollywood', which promises to be a winner! The STAR team has done all the edits on this album, and they made magic once more! Unlike other 'import' labels, they truly were able to produce a great 'new album , using many incomplete takes , to create beautiful new tracks. Their professional edits will blow you away, and will make you believe these are unreleased takes. Some new 'alternate masters' were made and the result is amazing; just listen to the breathtaking version of 'Steppin' Out of Line' or the new 'bluesy' opening of 'Slowly But Surely'. Elvis fans have been spoiled over the years, and they all know.. 'the end is near' almost every complete take available has been released, so this is as close as you can get for a 'New' album, an album which won't leave your player this summer! Tracks marked with * are previously released.